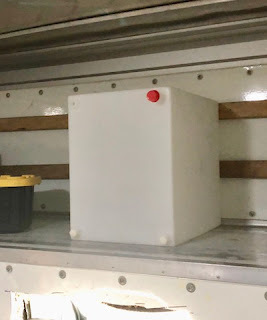 Installing my 26-gallon water tank into Box Van's overhead area is next. This tank needs installation before beginning to frame my living quarters. Filling this tank will be done using a water hose coming thru Box Van's big roll-up door. My living quarters will have a raised floor which will contain R-Tech 1" thick insulation. I have not determined what kind of flooring to use. It will not be the laminate flooring that I installed in Scampy. That flooring was difficult to lock on! Now that I have installed the 9-drawer cabinet and the tall cabinet, there is room to temporarily move these 4-items into my workshop during construction. Do you recall when Box Van's propane tank was installed? Mike from Santee Welding asked for Box Van's side skirt to be taken off for better access. I spent part of the afternoon looking for stainless steel hinges and screws. When finished, the reinstalled side skirt will swing up and out of the way for propane filling. Note: Hang-fire jobs such as this side skirt had to be completed before the beginning of my living quarters construction. The side skirt was being temporarily kept up on the overhead and got in the way of the fresh water tank install. For your floor surface, I'd like to suggest one of the many varieties of adhesive-backed flooring tiles available. They come in many surface finishes,from stone to wood. I have used these quite succsssfully, both in my home and my motorhome. A trick I use to ensure reliable bonding is to coat the surface with water-based polyurethane and then apply the tiles when the poly has dried to a still-tacky state. I've never had adhesion issues anywhere I've used this method. Yours is just the kind if comment that I HOPED that I would receive! Also, if I may suggest, the big box stores carry a flooring uderlaymentioned specifically designed for bathrooms and kitchens where water could be an issue. It has a very nice sanded finish, almost like furnature grade birch plywood. It's an excellent surface for vinyl tiles. It's not cheap at about $40 per sheet, but is a very fine plywood for many uses. What you don't use for the floor, you'll find other uses for. Do you believe that water on the floor will be a problem for me? The flooring Joe suggested is exactly what I was thinking of as well. I didnt' suggest that product specifically for its water rwsistance, but for its very high quality as a substrate for tile floors of any kind. Alternative would be luan, but that tends to delaminate easily. Do as you think best. Something to consider about that water tank... There could be lots of weight sloshing around very high up in the vehicle and that movement might make it uncomfortable to drive. I worked at a place that outfitted 2 large deep-cycle batteries into that space in a truck-camper and it made the thing bounce around like mad. If you are commenting to me, you must have a Google or some other identity. It is easy for you to get one. I have learned never to underestimate George! Box van is sprucing up nicely. Happy belated thanksgiving. Will you add windows to the back wall so you can see out when the roll-up door is open? Instead of windows, I am considering high resolution video screens. There is no pass-thru door. There is a pass-thru opening that is closed off by using a throw (A small blanket). Light coming thru Box Van's windshield does not reach the interior of the box when the throw is in place. I am excited because this project is a fantastic thing for me!! Hi George, might I suggest a second 26 gallon fresh water tank installed on opposite side. it sure would extend your boondocking capabilities. Consider adding an overflow hose from the top of the water tank out of the van. Otherwise you'll have a hard time getting it filled just right. OK! I will consider an overflow hose! I have not thought about cork flooring. I have not even viewed ads for it. Hi George... what amazing progress already... I agree on the suggestion for that 2nd water tank. Easier to add now than later. Re the hose to fill it/them... could you run one of those white water hoses to your back door and leave it in place all the time to fill the tank(s), and then use a second hose to attach to the permanently installed fill hose? And maybe a replaceable water filter near the end of the fill hose. Nice to know you are getting decent water. We do not filter our rv water supply because we drink only distilled water -- so if you are not drinking the tank water then the filter is not likely needed. Btw, have you ever thought of hiring an agent to sell the movie rights to your life to Hallmark or Ophra... it would be a smash hit. Your trips to Israel, your air plane rides on the Mexican beach, your conversational Spanish, your stealth camping, your Tioga crash, quitting your meds, scampi and now Box Van! So much more! It would be a box office hit! I think viewers would think the screen writers had too great an imagination. What a life and so much more to do as nd enjoy. Thank you for sharing your suggestions with me! Ernie.... "A movie agent?!" Wow! Ernie, I enjoy your sense of humor. A full 26 gallon tank will weigh about 200 lbs. Make sure that the shelf can handle this weight when bouncing down the road. Box Van is a used U-Haul moving truck and is able to handle 7-tons! That is a huge load! A 200-lb water tank is no problem for Box Van! Box Van is sooooo powerful! You can't put 7 tons of weight up there. Good grief George, is this how you engineer things? No wonder you have to do everything twice! Hi again George.... please consider stainless nuts and bolts with a lock washer to hang that skirt. 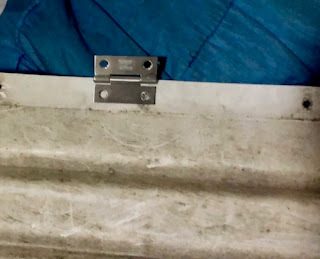 I have had to replace several screws that seem to work themselves loose on my rv... especially plastic side panels near my wheels...lots of vibration. Once I use stainless nuts and bolts the panels stay in place.... especially with a lock washer. Just a thought. They are stainless bolts and nuts. Now I know you love Amazon or you think they're great but the shark bite fittings you can get at any plumbing supply place as well as Home Depot Ace hardware and Lowe's. Those hinges are fine and not ugly. The hinges are not visible as they hang behind the side skirt. I considered a piano hinge and decided that the hinges that I bought are good enough. I already know all those numbers. After all, it is my truck. I should know what I own. I just made a Blog post showing Box Van's specs in today's Blog. This is your posting:: Box Van is a used U-Haul moving truck and is able to handle 7-tons! Please explain to this idiot:: how many pounds can you put IN, or CARRY, IN your box van ? You are asking me for the number for Box Van's payload. The payload is 5,930 lbs. All of these comments mostly concern the placement of my water tank in Bix VAn's overhead. That was what I was addressing when I replied about 7-tons. It seemed ridiculous to me for readers to worry about 200 lbs of water in a tank when Box Van weighs 7-tons.